"We need to take their message and keep shining the light on what is going on," said former U.S. ambassador Mari Carmen Aponte. More than six months after Hurricane Maria decimated Puerto Rico, the island's ongoing struggles are far from being resolved. For stateside Puerto Ricans in high-profile positions, their fundraising and recovery efforts are taking on added urgency as the voice for their island families. “We’re all paying attention to how long it takes for them to get back up,” said former Hamilton lead actor Javier Muñoz, who was born and raised in Brooklyn, New York to Puerto Rican parents. Mainland Puerto Ricans are raising money and leading reconstruction efforts at a time when more than 100,000 people in the island are still living without electricity. Over 135,000 Puerto Ricans have been displaced. The island is grappling with significant issues such as a four-decade old power grid that was in bad shape before the hurricane virtually destroyed it. In addition, many families have not seen FEMA money to rebuild their homes as questions of how to prove ownership in generations-old properties have not been resolved. In the meantime, many communities are still in recovery mode. Last week, several Puerto Rican former officials in the Obama administration spearheaded a service trip to the island to revamp two schools in the hard-hit area of Cataño, where sixty percent of its residents lost their roofs during the hurricane and almost half of the population lives below the poverty level. The 25 former Obama administration officials included former Education Secretary Arne Duncan. The group, working with a local non-profit, ConPRmetidos, prepped walls, painted, made structural repairs and unpacked new classroom supplies for 700 students, said Eric Waldo, a former deputy chief of staff at the Department of Education, who was born in Alabama and whose mother is Puerto Rican. “At the end of the day, a young person just wants an adult who cares about them. And, it matters.” said Waldo. “We want this to be emblematic of what could be done to help the island,” said Cynthia Romero, former communications advisor at USAID, who helped organize the service trip. U.S. Puerto Ricans say they are trying to keep in the forefront a community that has historically not been as vocal, even when living without electricity for more than half a year. “We don’t have, in Puerto Rico, the sense of entitlement,” said Mari Carmen Aponte, former Assistant Secretary of State for Western Hemisphere Affairs and a Puerto Rico native. Puerto Ricans, who are U.S. citizens since 1917, are the second largest Latino group in the U.S. Though they have steadily migrated in different population waves since the 1940s, the island's financial crisis in the last decade has created an historic exodus to the mainland. The Puerto Rican population in the U.S. reached 5.3 million in 2015, with more Puerto Ricans in the mainland than in the island, which was at 3.5 million. Hurrricane Maria exacerbated the out-migration from the island, said Luis Martinez, history professor at the University of Central Florida. “Right now there’s hundreds of thousands,” said Martinez, referring to the number of Puerto Ricans who recently arrived in Florida. Puerto Ricans have power behind their numbers, said Florida International University professor Jorge Duany. But mainland Puerto Ricans need to continuously organize their clout in order to solidify their influence, especially politically. Unlike island Puerto Ricans, mainland Puerto Ricans can vote in stateside elections and become the “swing vote within the swing state of Florida” at this year’s midterm elections, said Duany. This could help them gain more allies in Congress as they advocate on behalf of the island. “Their [stateside Puerto Ricans] continuous involvement supports this idea that little attention is given to Puerto Rico,” said Duany. Immediately after Hurricane Maria, many of the most well-known Puerto Rican faces in the U.S. — from Lin-Manuel Miranda, Jennifer Lopez and Marc Anthony to Rita Moreno and tennis star Gigi Fernandez, wrote songs, raised millions of dollars and traveled to the island to bring supplies and lend crucial support. In the artistic community, the efforts have continued. Actors Rosie Perez from NBC’s Rise and Ramón Rodríguez Jr., in Season 4 of Showtime's The Affair, were raised in New York City to Puerto Rican parents. 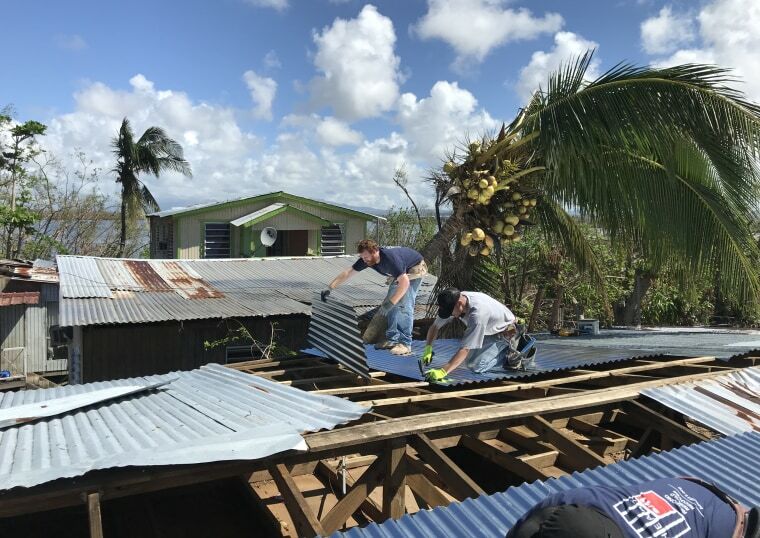 They recently helped launch a carpentry program in the island in partnership with Heart 911, which sends rescue teams to areas hit by natural disasters, and Puerto Rico's Sacred Heart University. They brought skilled carpenters and builders to train residents of La Playita, an under served community in San Juan. “The fact that people are living under such conditions," Rosie Perez told NBC, "pains me." The training, said Perez and Rodriguez, can help people get jobs at a time of high unemployment and a steep poverty rate. Recently, several high-profile Puerto Rican comic book artists and celebrities collaborated on a new graphic novel, Ricanstruction: Reminiscing and Rebuilding Puerto Rico, created in conjunction with DC Comics; the sales' proceeds will go to different non-profits. "Comics are stories about social justice," said Edgardo Miranda, a New York-based Puerto Rican creative director who several years ago created La Borinqueña, a memorable Afro-Latina superhero from Puerto Rico. "If anyone gets the importance of writing these stories, it's us." The 200-page anthology includes stories by actress and activist Rosario Dawson, Hamilton's Muñoz, Grammy-winning musician Ruben Blades, acclaimed author Esmeralda Santiago and Sonia Manzano, who played the iconic Maria on Sesame Street. "By grabbing this book, you can too become a hero because the money will be used to help Puerto Rico," said Puerto Rican illustrator Emmanuel Lugo, who drew the story written by actor and poet Lemon Andersen. Still waiting for power: Six months after Hurricane Maria, frustrated Puerto Ricans rally in D.C.
Puerto Ricans who have made a mark in the literary world are turning to their art to help the island. Award-winning poet and educator Willie Perdomo organized #PoetsforPuertoRico, with dozens of notable artists such as Obama's inaugural poet Elizabeth Alexander and Pulitzer-prize finalist Martin Espada raising about $12,000 in readings around the country. “I used a tool that I know best, poetry, to engage in a level of activism," said Perdomo. As islanders continue to live through the longest blackout in U.S. history, U.S.-based Puerto Ricans hope their clout keeps them in a much-needed spotlight. “One has to be heartless to see an entire island drowning and not want to reach out to help,” said actress Rosie Perez.